Do your ad reps a favor and play this video at your next ad sales meeting. One of the biggest complaints I hear from ad managers is that when their ad reps are making cold calls, their prospective advertisers immediately shut them down before they can even get the sales process off the ground. The vast majority of their cold calls, they say, end within the first 30 seconds and the ad reps move on to another prospect, hoping that by increasing the volume of their calls they'll be able to make goal. Think of all the money that your newspapers are leaving out there in the marketplace simply because of difficulty with this one short interaction. Imagine the revenue implications for your ad reps and your newspaper if 90% of the time their cold calls would move on to the next step. I'm going to show you and your ad staff how to do this. It'll dramatically improve the ad reps' cold call successes and increase their efficiency and effectiveness so much that their territories could even return to pre-recession levels. This video was recorded for my Presentation Pack clients and taken from my Response Oriented Selling course. Since it works virtually every time and has gotten such great feedback, I thought I'd post it here on my blog so everyone can benefit. 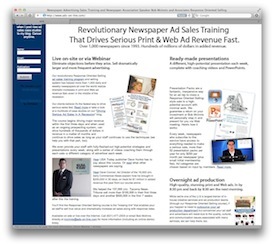 I cover upfront stalls and objections such as "I have no money", "Your newspapers don't work", "You're too expensive", "We're in a recession", "Print is dead", and "You don't have enough circulation". Here's a preview of what I talk about in the video. What most ad reps say rarely works are the stock answers to most objections that we (and the prospective advertiser) know. Typically, when the prospect says, "Your circulation is declining and everyone's on the Web," the ad rep instinctively answers the objection itself, responding "Let me share with you information on our circulation and impression figures and our print and online readers. You'd be surprised." When the prospect says, "I have no money," too often the ad rep typically responds, "We actually have a number of very affordable programs". When the prospect says, "Your newspaper doesn't work," typically the ad rep says "Let's take a look at your ad so we can find the problem". The key here, is not to counter the objection at all. It's all about agreeing with them and shifting the discussion from what the prospect is telling you (like "I have no money") over to what he's really thinking ("I don't think you're here to make me money"). It works almost every time with virtually every objection. Without this move (and the rest of our Response Oriented Selling course), eventually the ad reps and even managers start believing what the prospects are saying, leading to a discouraged team and even lower sales. So, enjoy the little piece from my course. I'd suggest showing it to your ad reps in your sales meetings and having them keep watching and practicing until they're good at using this move for every upfront stall and objection. Since it was created to help coach members of my Presentation Pack service and these members know my entire sales process, the video will mention next steps (like teaching the Response Model) which I don't get into here, but this video should help a lot. Call or email and I'd be happy to give you a free consultation to see how I could help you drive some serious ad revenue in this economy.